My older brother Dave has a passion for history and a keen eye for historical accuracy. In 2013 he read and critiqued the first two of Ken Follett‘s trilogy about the 20th century: Fall of Giants and Winter of the World. These reviews continue to generate interest with readers. Follett’s third novel is out – Edge of Eternity – and, once again, Dave has a few comments about historical accuracy and perspective. “Did you enjoy the books,” I asked when we spoke on the phone. Here’s his response. Dave: I have read all three books of Ken Follett’s trilogy over the past year and a half and enjoyed reading each of them. I must admit I liked the first two, Fall of Giants and Winter of the World, better than the third, Edge of Eternity. At over 1000 pages, it was a long read! However, Ken Follett’s treatment of the book’s major theme of the quest for freedom and equality, for both American blacks and the citizens of the former Soviet bloc East Germany, were well handled. He brought these lofty concepts down to a very human level, through the eyes of his characters. Follett covered every emotion, from deep despair to jubilation, in his telling of this story. As a side note, it’s sobering to realize that major events like freedom rides in the American south, the Cuban missle crisis, and the building of the Berlin Wall, are now considered part of history. I vividly recall visiting Florida as a youngster in the late 1950’s and seeing the sign “Whites Only” in a laundromat. Now the American President is a black man. I remember the tensions caused by the building of the Berlin Wall in 1961, and was emotionally moved watching scenes of the Wall being knocked down by Berliners in 1989. Most of us who are “boomers” have seen some amazing changes in the world over the years, many of them for the good. Hopefully this will continue. And now for Dave’s thoughts on historical accuracy. 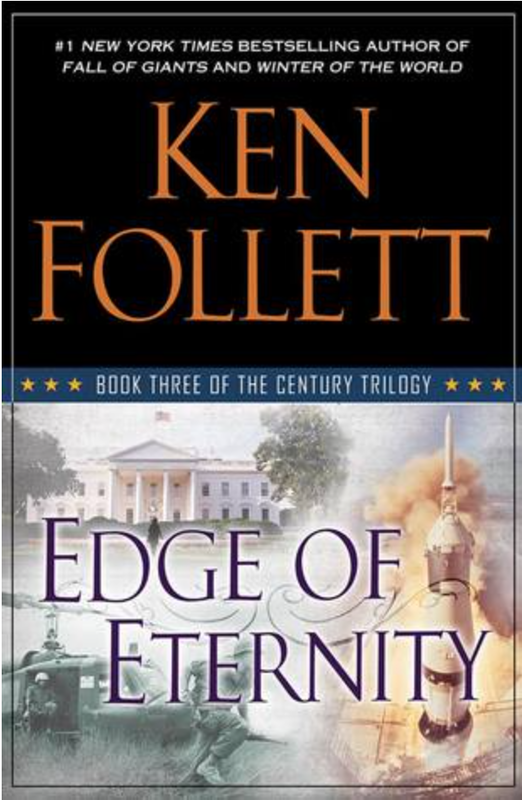 I recently read Edge of Eternity by Ken Follett, the last volume of his trilogy spanning the 20th Century. The first two were Fall of Giants and Winter of the World. Edge of Eternity‘s Chapter 41 – Flower – 1968 deals with the Vietnam War’s Tet Offensive in February of that year. In this chapter, journalist and Vietnam War veteran Jasper Murray discusses the Tet Offensive with his editorial staff colleagues for the TV news show This Day. Called the “astonishing Vietcong operation” (p. 710), Murray states the objectives of the VC with Tet were to “demonstrate their power and reach and thereby to demoralize the South Vietnamese regime, our (US) troops, and the American people. And they have succeeded (p. 711).” In addition, Murray feels that the US military and the Johnson administration were lying to the American people about the war’s progress. The Vietcong’s success during Tet laid bare the lie. Even 40 years on since the end of the Vietnam War, controversy still reigns. Viewpoints about the war are often the result of political or moral stance, rather than what actually happened. I have put together the following critique of Jasper’s argument. 1. Tet was not solely a Vietcong operation. It was carried out by both North Vietnamese regular troops, called the People’s Army of Vietnam (PAVN), and the Vietcong, the military arm of the South Vietnam-based National Liberation Front. Both had a central command structure that was controlled by the North Vietnamese communist regime of Ho Chi Minh in Hanoi. The VC specialized in guerrilla tactics that included hit-and-run ambushes, bombings of public and government buildings, mines, booby traps, and executions of local government officials, police, doctors, teachers, professionals and anyone else who they felt supported the South Vietnamese regime. These tactics were not new; they had been developed over the previous 40 years in conflicts such as Ireland, China, Greece, and Algeria. Tet in 1968 was really the first time PAVN and the VC attempted a full-out military assault on cities and military bases in South Vietnam. Using the Ho Chi Minh Trail which ran from North Vietnam south along the western border of South Vietnam, and the tunnel network through the South, PAVN and VC forces struck simultaneously at more than 100 centres in the South. PAVN mainly concentrated on targets in the northern part, and the VC mainly in the southern part of South Vietnam. 2. Did, as Jasper Murray claims, the military and the Johnson administration lie to the American people about Vietnam? Those who believe that are really saying that all those in authority routinely lie in order to maintain their power. This is both cynical and simplistic. In a western democracy such as the United States there are legislative checks and balances in place, as well as a robust press. Those who lie get found out and punished. Richard Nixon’s Watergate experience is a good case in point. Until the Tet offensive, the American public was at best luke-warm in their support of US involvement in Vietnam. The Johnson administration and the military leadership knew this and therefore tried to put the best public relations “spin” on the supposed progress in the war. This despite their on-the-ground troops and intelligence sources warning for months before Tet of a huge build-up of enemy troops and material that were moving down the Ho Chi Minh Trail. When the Tet Offensive began, American chief of staff in Vietnam, General Westmoreland, reportedly angrily exclaimed to his headquarters staff that he was being told “what I want to hear, not what I ought to hear” about the war’s progress. 3. Was the Tet Offensive a victory for the VC, PAVN, and the Hanoi regime? Militarily, no. After initial successes, particularly in Saigon and Hue, PAVN and VC forces were driven out by the Americans and their South Vietnamese allies. Later in the spring, the siege of Khe Shan, the US military base near the Demilitarized Zone (DMZ) border with North Vietnam, was lifted by American forces. In addition, while as Jasper Murray indicates, the exact number of VC and PAVN casualties can be debated, their losses were significant. So much so that the VC largely ceased to be an effective fighting force after Tet. From 1968 on, PAVN increasingly assumed the leadership and combat role in South Vietnam. However PAVN was so weakened by the Tet Offensive, they were not able to mount another major offensive for 7 years, in the spring of 1975. Despite at least 15 years of US technical, financial, and logistical assistance, the South Vietnamese Army crumbled in face of the onslaught. By that point, the US had lost its appetite to intervene, and so the Saigon regime of South Vietnam fell to PAVN forces. 4. Politically, however, Tet was a major victory for the Hanoi regime. Its initial success seriously damaged the reputation of the South Vietnamese regime among its civilian population. Tet showed the regime and its army could not effectively protect its citizens from attack. More tellingly, the Tet Offensive tipped American public opinion against the war. Influential publications such as Time magazine and the New York Times, and respected news anchors such as CBS’s Walter Cronkite, became increasingly critical of US involvement in Vietnam. Shortly after Tet, the US initiated peace talks in Paris. They also began to ratchet back their direct military involvement, and encourage a “Vietnamization” of the war, which ultimately proved unsuccessful. In this respect, Jasper Murray was right. Hanoi, through its initial success with Tet, had won the psychological battle for Vietnam. Many thanks for your thoughtful comments, Dave. You can review historical fiction any time on A Writer of History! M.K. Tod writes historical fiction and blogs about all aspects of the genre at A Writer of History. Her latest novel, LIES TOLD IN SILENCE is set in WWI France and is available in paperback from Amazon and in e-book formats from Amazon, Nook, Kobo, Google Play and iTunes. Her debut novel, UNRAVELLED: Two wars. Two affairs. One marriage. is available in paperback from Amazon (US, Canada and elsewhere), and in e-book formats from Amazon, Nook, Kobo, Google Play and on iTunes.